SANTIAGO — For 150 years, the British Museum has housed one of the iconic, heavy-browed stone figures that Chile’s Easter Island is famous for. Now the islanders are hoping desperately to get it back. They plan to build a copy of the four-ton monolith and, potentially swap it for the real thing. The statue, known as a "moai" and named the Hoa Hakananai’a, is one of hundreds originally found on the island. Carved by Polynesian colonisers somewhere between the 13th and 16th centuries, each of the big-headed figures was considered to represent tribal leaders or deified ancestors. About a dozen have been removed from the island over the years. Now Camilo Rapu, president of the island’s Ma’u Henua community, said it’s time Hoa Hakananai’a was returned. The Ma’u Henua community, with Chilean government support, launched a campaign in August to persuade the British Museum and Queen Elizabeth II to return the famous moai – in exchange for an exact replica to be carved on Easter Island. "Our expert carvers will make a copy in basalt, the original stone used in the Hakananai’a moai, as an offering to Queen Elizabeth in exchange for the original," Rapu told reporters in Santiago. The Ma’u Henua have signed an agreement with the Bishop Museum – Hawaii’s largest museum, with a huge collection of Polynesian artifacts – to produce a polycarbonate copy of the Hakananai’a, to be ready by November 3. The actual carving of the statue will take place on Easter Island, using thousand-year-old Rapa Nui techniques – combined with some modern technology to allow the job to be completed in seven months. The Hakananai’a moai in the British Museum stands 2.4 meters tall and weighs about four tons. 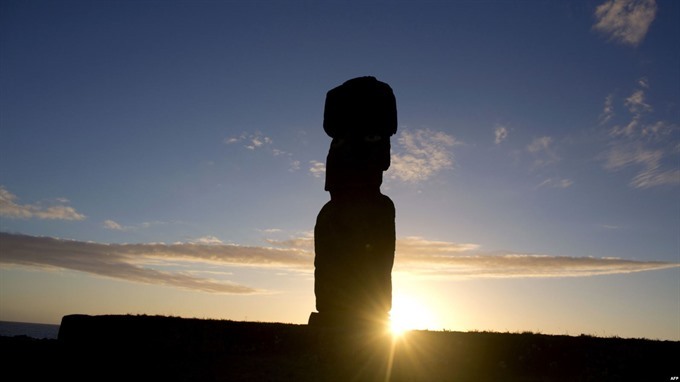 On November 23, a committee of islanders and Chilean officials plans to travel to London in hopes of negotiating the moai’s return. "This is a historic demand of the Rapa Nui people," said Rapu. The Rapa Nui were the island’s aboriginal settlers, and their descendants still make up a large part of the population. "This moai has a spiritual value; it is part of our family and our culture. We want her (the queen) to understand that for us, this is its value – not as a museum piece," he said.